Once, there lives a fox and a stork. The fox and the stork are friends and they always visit each other. One day the fox invited the stork to his house to have a meal. The fox didn’t give the stork anything to eat but some soup in a very shallow dish. The stork tries to drink the soup from the dish but it couldn’t. It could only wet the tip of its bill. At last, the stork went home as hungry as when he just came to the fox’s house to have a meal. The next day, the fox pays the stork a visit. 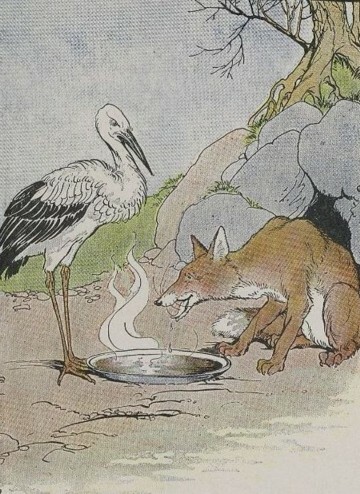 The stork decide to revenge on the fox by setting the fox’s meal in a very long necked jar. The fox tries to put in his snout but he couldn’t drink the soup in the jar. If you do something bad to someone, the person will also treat you back the same way.